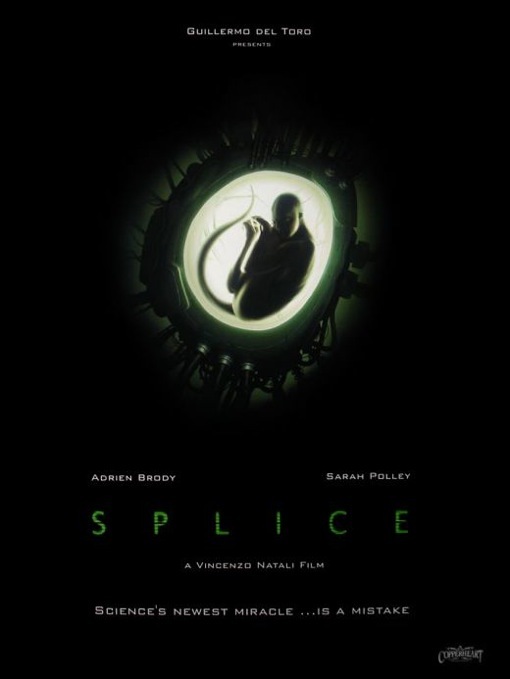 Looking at the poster above, you would think the new sci-fi horror flick Splice was some kind of cloning-era mish-mash of Alien and Species. Based up the trailers, you would think that too. On the surface all would point to this. Well, golly, who knew you would be so wrong? The film opens with a terminally hip power couple turned scientists-du-jour (Oscar winner Adrien Brody and indie film darling Sarah Polley) working for a pharmaceutical company (headed by a cold and demanding French woman played by Simona Maicanescu) splicing away to create a new species that can be used for the harvesting of therapeutic and disease curing genes. Upon threat of being shut down and not allowed to continue their experiments, Polley’s character has the awful idea to splice in some human DNA on the sly — just to see if they could’ve done it, you know, that old song and dance. The result — you guessed it — is a fast growing super-freaky French mutant (Delphine Chaneac) with wings and a long-tailed stinger who likes to play Scrabble.